The online applications will start on the official website-admissions.cusat.ac.in from January 30, 2019. 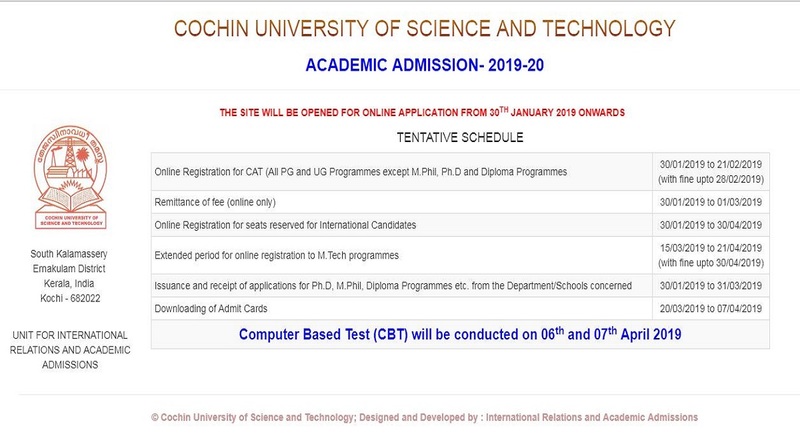 CUSAT CAT 2019: The Cochin University of Science and Technology will start the registration for the online Common Admission Test on April 6 and 7 for the admission to various undergraduate/ postgraduate courses. The online applications will start on the official website-admissions.cusat.ac.in from January 30, 2019. The last date to apply for courses is February 28. For M.Tech courses, the online applications can be submitted till April 21, 2019. The Computer-based test will be conducted on April 6 and 7, 2019. CUSAT will be conducted in 28 centers across the country. • MSc, LLM, MVoc, MCA, BVoc, LLB, BTech examinations will be conducted on April 6. • BTech, M.A (Hindi, Applied Economics), BBA, LLB, BCom, LLB, MCA/MSc (Computer Science) (Lateral Entry), LLM (IP) Ph.D., LLM (IPR) Ph.D., the exam will be conducted on April 7. • For admissions in MPhil, Ph.D. and diploma courses, the application form will be available from the respective departments. • Undergraduate examinations: The candidates should have passed class 12 or equivalent from a recognized board. • Postgraduate examinations: The candidates should score at least 55 percent marks and science with mathematics as one of the subjects or they should be a graduate in Electronics/Information Technology/Computer Science/Computer Applications/ Engineering/Technology. For more information, the candidates may check the official website.